Max Ogles is a behavioral designer studying at the University of Oxford. He writes at MaxOgles.com about psychology, technology and behavior. I made just one innocent political comment and it practically started a war. The conversation quickly escalated until my conservative aunt Karen was yelling at Chris, a left-leaning friend from high school. Once Karen stopped yelling, Chris responded with a thoughtful, tempered response –except for the thinly veiled Hitler reference at the end of it. In truth, Karen and Chris have never met in person, and they live thousands of miles apart; this encounter happened on Facebook (names changed for this essay). I have seen dozens of similar conflicts in the past few months and admit to shamelessly engaging in some myself. Yet, if Karen and Chris had met face to face, I think their conversation would have gone differently. The social norms of in-person communication clearly don’t exist online, and Facebook is limited by constraints of design, structure and algorithms — constraints that don’t exist in person. So how can Facebook make politics less painful? Let’s take a look at four behavioral design strategies Facebook could use to facilitate discourse and help you avoid offending a good friend’s aunt! In the middle of a heated conversation, we sometimes forget we’re talking to a person, not a target. What’s worse is that most of the people we encounter on Facebook are connected to us within two or three degrees. Karen and Chris are just two degrees apart, with me as their mutual connection. Before emotions lead them to start verbally assaulting each other, they need subtle reminders: “Max likes and trusts this person… maybe I should give them the benefit of the doubt.” Facebook can do more than just indicate that I am a mutual friend; it can contextualize the relationship and make that information visible as the conversation occurs. I’ve encountered this situation myself: As I angrily began crafting an argument in response to some woman I thought was “clearly irrational,” I realized I was going head to head with my good friend’s mom! This realization instantly diffused my emotions. I edited the “snide” out of my remarks and, while I still disagreed with her stance, we had a pleasant, productive conversation. In a 2008 research study, radiologists were presented with photos of their patients as they analyzed x-rays for those respective patients. This tweak helped humanize the radiologists’ work, and, as a result, they felt more empathy toward their patients. To the benefit of the patients, the radiologists were also more meticulous in their analyses when presented with the photos. While photos abound on Facebook, they seem to have found second-tier status in comments, as they’ve been reduced to a few hardly visible pixels. Applying the principles from the radiology study, Facebook could make photos (specifically faces) much more noticeable. If the psychological effect from the radiology study holds here, larger profile images would encourage users to have empathy and be more deliberate and “meticulous” with their comments. The last time you met someone new, you probably followed a familiar pattern of questioning: What’s your name? Where are you from? What do you do? When we meet new people, we assimilate who they are within the context of our own personalities. We quickly filter through questions to determine how they are like us. The rote conversation veers off course as soon as we find a shared connection. “Oh, you live in Ohio? I grew up in Ohio…” In this sense, introductions are a methodical checklist to uncover shared interests, and research studies have proven that shared interests are the basis for friendship in online networks. The social norms of in-person communication clearly don’t exist online. Unfortunately, Facebook interactions don’t often lead with introductions. Your first exposure to someone might be a comment that hotly contradicts your own beliefs, while the reality may be that you have much more in common with that person than you realize. When you hover over a name or photo in Facebook’s News feed, a small profile box appears so you can see a mini-introduction to that person. However, information such as “9 new posts,” which Facebook currently displays in the profile box, doesn’t seem very useful. Instead, Facebook should mention mutual friends (as it currently does) and introduce mutual interests. Isn’t that more friendly? Even something as simple as the heart icon in this example could have a positive psychological influence on users as they formulate opinions about strangers. A few months ago, I observed a particularly awkward Facebook conversation that escalated way too quickly — something we’ve all seen. My friend John (name changed) shared a political opinion in a post, then a friend of a friend reacted with personal attacks, logical fallacies and the whole arsenal of troll techniques. Rather than feeding the flames, John simply deferred, saying “It looks like we have different opinions, but more importantly I respect you as a person and your right to express your beliefs.” And that was the end of the conversation… or so I thought. Instead, the troll doubled down! More personal attacks, more flawed logic — and John was left wondering whether he should remove the post altogether. A simple Facebook feature could empower users to more easily moderate their posts: disabling comments. This way, when Karen and Chris start arguing, and I begin to feel uncomfortable with how they’re talking to each other, I don’t have to remove the post completely. After all, it’s my post, why should I allow Karen and Chris to commandeer it? At the same time, I don’t want to delete their comments because I’m afraid they might feel like I singled them out. Instead, I could just disable comments. 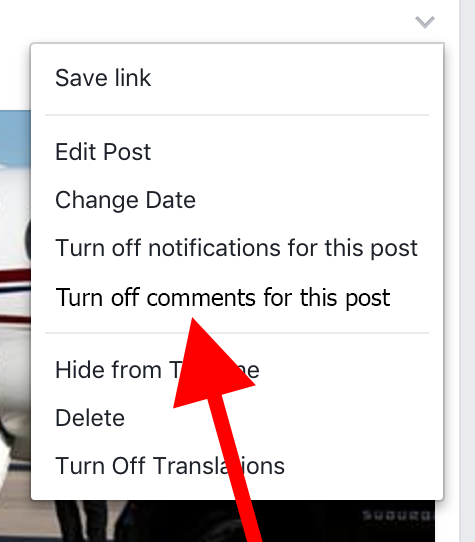 Facebook already allows you to turn off notifications for a particular post, so disabling comments is a natural step to empower the owner of the post. Other platforms, including YouTube and Instagram, allow you to disable comments, so it’s not clear why Facebook avoids it, and I certainly think it would be a useful feature in this context. These are just a few ideas to apply behavioral design in a way that might improve debate on Facebook. Do you think they would work? What ideas have I missed? I’d love to hear your thoughts. Thanks to Tookie Graham, Sagar Doshi, and Dustin Skinner for reading versions of this article.